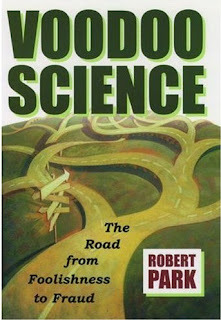 Robert Park's 2000 book, "Voodoo Science," examines the natural human tendency to see patterns in life, the pitfalls this tendency leads to in modern society, and some of the schemes that have been set up in the past to intentionally exploit this trait for the purpose of making money. Covering topics as wide ranging as perpetual motion, the international space station, homeopathy and UFOs, Park applies the basic laws of thermodynamics to various hard-to-swallow modern-day miracles. While introducing a few simple rules to help any inquisitive person separate true innovations from what Park calls "voodoo science," the author shows that even the best and brightest of mankind's scientific world have been duped in the past, often by their own wishful thinking. This book is a quick read, designed more for the layperson than a highly technical audience. The author lays out his reasoning in terms that are simple and clear enough for a general audience, but carry enough weight to overturn sometimes very cleverly constructed arguments for the impossible. I read it in two days over Christmas break and would recommend it to anyone who has heard of a car that runs on water or knows someone who swears by their homeopathic remedies. It's both entertaining and informative, and as someone who has seriously wondered if some of the ideas covered in Voodoo Science are actually possible in a universe that has been described with both Newtonian and Einsteinian physics, it's nice to know I'm not the only one that's been taken by the wish for free energy or the attractive American fable of the backwoods inventor.